Intrahepatic location of pancreatic pseudocyst is a rare manifestation of this common complication of acute pancreatitis. We present a case of 32-year-old man with pancreatic pseudocyst located in liver secondary to an episode of alcoholic pancreatitis. The patient presented with abdominal pain of 1-month duration associated with fever for 10 days. During admission, the patient underwent an abdominal computerized tomography (CT) scan which revealed two large-sized hypodense areas, one in liver and one in pancreas. A percutaneous needle aspiration of the liver was done under ultrasound guidance which showed elevated amylase level. Pigtail catheter was placed to drain the intrahepatic cyst. The patient responded well to this intervention treatment, and there were no complications on follow-up. Intrahepatic pseudocysts should be considered when an intrahepatic collection is encountered in patients with a recent episode of acute pancreatitis. CT associated with high levels of amylase in the hepatic collection is often helpful in diagnosing this unusual complication. Pancreatic pseudocyst is an encapsulated collection of fluid with a well-defined inflammatory wall, which is made of nonepithelial lining of fibrous, necrotic, and granulation tissue secondary to pancreatic injury. This usually occurs 4 weeks after onset of interstitial edematous pancreatitis. Pancreatic pseudocysts are a complication of both acute and chronic pancreatitis. Most of the pancreatic pseudocysts are located in the body and head of the pancreas, but 20% of them are extrapancreatic (pelvis, mediastinum, liver, pleura, and spleen). A systematic review had shown that intrahepatic pseudocyst of pancreas most commonly involve the left lobe of the liver. A 32-year-old man presented with dull abdominal pain located in the upper abdomen associated with fever for 10 days' duration. Abdominal pain was insidious in onset located in the epigastric area and was of moderate intensity; there was no radiation of pain, relieving, or aggravating factors. He had fever for last 10 days which was high grade and intermittent; there was no history of cough, sputum production, jaundice, vomiting, loose stools, or any urinary complaints. There was a significant past history of acute pancreatitis 2 months back following a binge intake of alcohol. On examination, the patient was febrile with axillary temperature of 101°F, pulse rate was 100/min, and blood pressure was 130/80 mm of Hg. On abdominal examination, there was a palpable non-tender swelling of 4 cm × 4 cm in the epigastric area, soft in consistency, non-pulsatile with a smooth surface, and hepatomegaly was present 4 cm below the subcostal margin in the midclavicular line. Rest of the systemic examination was unremarkable. Investigation revealed normal hematological and biochemical parameters except elevated leukocyte counts. Serum amylase, lipase, calcium, and triglycerides levels were within normal limits. Ultrasonogram (US) and computerized tomography (CT) of the abdomen revealed a cystic collection of 12 cm in the right lobe of liver and 5 cm in the pancreas [Figure 1] and [Figure 2]. No gallstones were noted on US. US-guided fine aspiration from the hepatic lesion yielded clear fluid with an amylase level of 1900 IU/L (reference range: 0–160 IU/L). Culture sensitivity revealed growth of Klebsiella pneumonia sensitive to imipenem and colistin. Cytology for malignant wells was negative. Upper gastrointestinal endoscopy revealed no esophageal and gastric varices. Blood and urine cultures were sterile; amoebic serology and hydatid serology were negative. Cystic lesions of liver have broad differential diagnosis. Differential diagnoses which were considered in this case were amoebic liver abscess, hydatid cysts, simple cysts, cystic neoplasm, and pancreatic pseudocyst. US-guided pigtail catheter insertion and drainage was done, review ultrasound was done after 10 days, and catheter was removed. The patient was given intravenous antibiotic on the basis of culture and sensitivity report; analgesics were given for pain relief. The patient had fever for 4 days during his stay in the hospital; by day five, he was afebrile and his abdominal pain decreased markedly. On day 10, review ultrasonography was done and catheter was removed. He was followed after 2 weeks in the outpatient; there was no complication and he was doing well. Intrahepatic pseudocysts of pancreas, an unusual complication of acute, or chronic pancreatitis are usually single and most commonly involve the left lobe, but multiple intrahepatic pseudocysts have also been described., The pathophysiology of intrahepatic pseudocyst formation can be explained by two mechanisms., In the first mechanism, there is accumulation of pancreatic enzymes in the prerenal space, which erodes through the posterior peritoneum and into the lesser sac. From lesser sac, collection tracks along the lesser omentum or gastrohepatic ligament toward the liver leading to formation of left lobe subcapsular collections. The second mechanism involves tracking of pancreatic enzymes along the hepatoduodenal ligament from the head of the pancreas to the porta hepatis resulting in the formation of intraparenchymal collections. Intraparenchymal pseudocysts are located near the porta hepatis branches whereas subcapsular pseudocysts are located just beneath the liver capsule and are biconvex in shape. Intrahepatic pseudocyst diagnosis is difficult as it is not considered in the differential diagnosis of cystic hepatic lesions. For diagnosis of hepatic pseudocyst, CT is the imaging modality of choice; on CT, the content of pseudocyst appears homogeneous and hypoattenuating. In addition to this, aspiration of amylase-rich fluid confirms the pancreatic origin of the pseudocyst. There are no definite guidelines for the management of intrahepatic pseudocysts. Most of them resolve spontaneously and as such require no intervention. Pancreatic pseudocysts can become complicated in other ways as they may rupture, become infected, or obstruct the common bile duct, where percutaneous drainage of pseudocyst is often the treatment of choice. Barring a few symptomatic pseudocysts, almost every pancreatic pseudocyst, resolves spontaneously and needs no specific treatment., Recent trend in managing symptomatic pseudocysts involves less invasive approaches, for instance, endoscopic and imaging-guided percutaneous drainage. The endoscopic approach involves creation of a stable pseudocystogastric tract through a process called cystogastrostomy. The advantage of percutaneous approach, however, is that the drainage can be monitored, catheter manipulation is possible, and cystic contents can be analyzed. Fine needle aspiration of the fluid and demonstration of high amylase levels in it helps to exclude other causes and confirm the diagnosis of intrahepatic pseudocyst of the pancreas. Banks PA, Bollen TL, Dervenis C, Gooszen HG, Johnson CD, Sarr MG, et al. Classification of acute pancreatitis-2012: Revision of the atlanta classification and definitions by international consensus. Gut 2013;62:102-11. Guesmi F, Zoghlami A, Saidi Y, Najeh N, Dziri C. Pancreatic pseudocysts located in the liver: A systematic review of the literature. Tunis Med 2009;87:801-4. Aghdassi A, Mayerle J, Kraft M, Sielenkämper AW, Heidecke CD, Lerch MM, et al. Diagnosis and treatment of pancreatic pseudocysts in chronic pancreatitis. Pancreas 2008;36:105-12. Hamm B, Franzen N. Atypically located pancreatic pseudocysts in the liver, spleen, stomach wall and mediastinum: Their CT diagnosis. Rofo 1993;159:522-7. Mofredj A, Cadranel JF, Dautreaux M, Kazerouni F, Hadj-Nacer K, Deplaix P, et al. 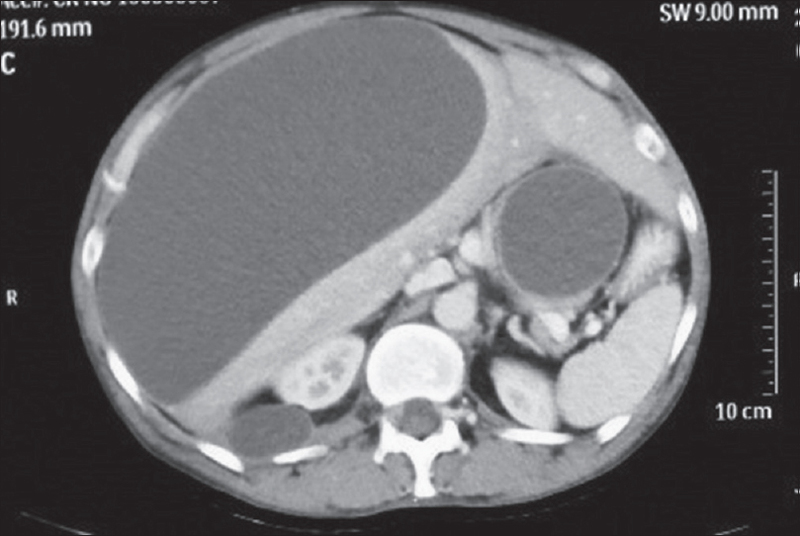 Pancreatic pseudocyst located in the liver: A case report and literature review. J Clin Gastroenterol 2000;30:81-3. Okuda K, Sugita S, Tsukada E, Sakuma Y, Ohkubo K. Pancreatic pseudocyst in the left hepatic lobe: A report of two cases. Hepatology 1991;13:359-63. Scappaticci F, Markowitz SK. 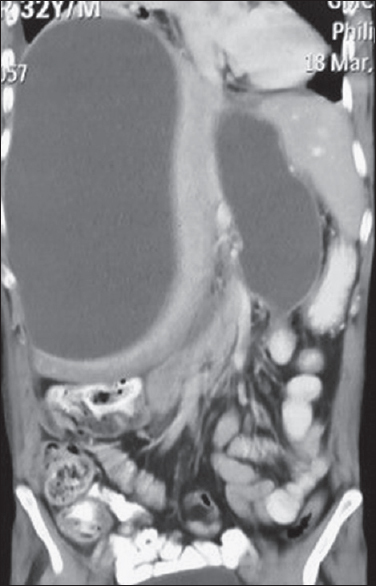 Intrahepatic pseudocyst complicating acute pancreatitis: Imaging findings. AJR Am J Roentgenol 1995;165:873-4. Mehler CI, Soyer P, Kardache M, Pelage JP, Boudiaf M, Panis Y, et al. Computed tomography of intrahepatic pancreatic pseudocysts. J Radiol 1998;79:751-5. Cheruvu CV, Clarke MG, Prentice M, Eyre-Brook IA. Conservative treatment as an option in the management of pancreatic pseudocyst. Ann R Coll Surg Engl 2003;85:313-6. Andrén-Sandberg A, Ansorge C, Eiriksson K, Glomsaker T, Maleckas A. Treatment of pancreatic pseudocysts. Scand J Surg 2005;94:165-75. Zerem E. Treatment of severe acute pancreatitis and its complications. World J Gastroenterol 2014;20:13879-92.